Tampa movers like Big Boys Moving and Storage have moved more houses than the average homeowner. Fortunately moving all of those houses means that we also have plenty of experience in chatting with homeowners and picking up tips on how to help our clients save money on their move! There are plenty of great frugal tips that you pick up when you talk to as many people as we do every day and today we want to share a few of them with you! Most people think that moving companies are out to take you for every penny you have during your moving experience. Here at Big Boys Moving and Storage, we like to think that we are the exception to the rule, however, because not only do we offer the most affordable quality Tampa moving services around, but we also love helping our clients to save even more! We always keep our ears open for great frugal moving tips to help you save more money on top of our great special rates and today we’ve got a few of those tips to share! If you can’t find a moving company like Big Boys Moving who offer moving boxes in their moving packages, try scouring through local classifieds, Craigslist, or online ads. People are always moving and that means that there are always moving boxes getting discarded. Just make sure that you stay safe when responding to ads and when you pick up your boxes, make sure that they are in good condition! When you are getting ready to head to your new home you’ll need to set up your utilities. Keep an eye out for coupons as well as companies that offer bundled services and you can save a ton. Shop around and compare companies to each other, many will offer to outdo competitors and you’ll save even more by being politely vocal. Just make sure that you are aware of the small print, these bundled service promos sometimes go up in price after the first 6 months to a year. The average cost of moving differs depending on the day you move, the month you move, and the season you move! If you need to save as much as possible on your move you will find the best rates on moving deposits etc. will fall in the middle of the week, in the middle of the month, and in the middle of winter. Yes, we know, everyone hates moving in winter, but if you’re truly looking to save money on your move, it’s the best way to do it! If You Don’t Need It, Sell It! If you’re a packrat and want to pay less for your move as well as earn some money to help with your move, look at selling some of your things. You can hold a yard sale or consider selling items to a consignment store that will offer you fair prices. Don’t expect to make a fortune, but it’s less that you have to pack and move and money you didn’t have before! If you are moving long distance or if you can’t move into your new place right away look into staying with friends or family. Most people like to book a hotel for the night of their move because they’re too tired to unpack, instead, save some money and see if you can grab the guest room at a friends house or stay with mom and dad! Heading across the country? Try contacting friends and family along the way who might be able to offer you a place to crash for the night. Know When to Shut Off Your Utilities! When you move out of your old home you will need to stop utilities from billing to your account for that house. Keep track of the date that you will be moving and contact your utility company to see if they pro-rate your bill if you do have to disconnect service in the middle of the month. Disconnect services as soon as you can but remember not to do it too early because no one wants there to be no water on moving day! Many of our clients say that they have a coin jar in the house that they keep all their spare change in. Come moving time, they just cash out those coins and use the money to help with their move. They even find coins while they’re packing up for the move so they end up with extra! If you need to use storage facilities at any point during your move, look into companies that offer moving services and storage services. Here at Big Boys Moving and Storage, we offer both and when you use both of these services you not only get great rates but you also have one less trip to make when you do finally get moved into that new place! Moving day is not the day to be running around after the kids or trying to keep an eye on your anxious dog. Sure you could pay someone to babysit or pay for doggy daycare, but why not see if a friend or family member would volunteer to do the job for free? Just keep in mind that if they do it for you-you’re going to owe them a HUGE favor in the near future! Looking For Affordable Tampa Movers? Are you on the lookout for affordable Tampa movers who are licensed, bonded, and insured, and trusted by Tampa residents as the top Tampa moving company? 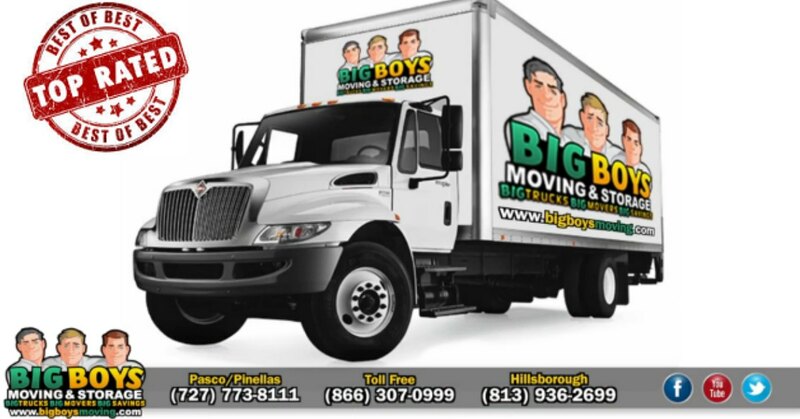 It’s time that you call on Big Boys Moving and Storage at 813-936-2699!